2. Place all ingredients in a bowl and mix together, roll small 40g balls and place in a tray, cover with crushed tomatoes and bake for 45 minutes, remove and cool. 2. Remove the inside of the pumpkin and cut into strips, place on baking tray and roast for 20 minutes, remove and place aside. 3. Heat a skillet and place silverbeet into it, add lemon juice and tahini, then season with celery salt. 4. 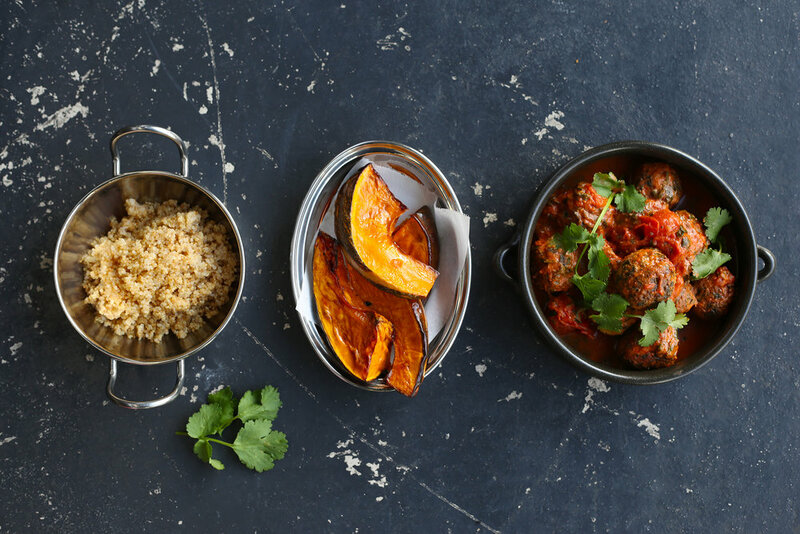 Serve your turkey meatballs on a suitable serving plate, and place the pumpkin and sautéed silverbeet alongside the meatballs.